While everybody has the same amount of time, not everyone uses their time the same way. The way you use your time determines how much you get accomplished every day. If you’re wondering how to be productive and waste less time, you have to be willing to make certain changes in your daily routine. 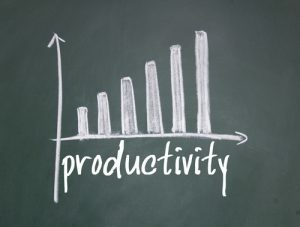 Let’s look at some ways to increase productivity so you get more accomplished. You can’t do everything in a single day so it’s necessary to decide what you want to focus on. Whether you use a traditional to-do list, an app or sift through your priorities in your mind, get clear about what you want to get done today. The best time to plan your day is the night before. This way, when you start work the next morning, there won’t be any doubt about what you want to do. Stick to your goals. Whether you’re trying to be productive at work or at home, one of the best techniques is to begin with the most pressing task of the day. This gets you off to a strong start and prevents you from getting diverted. It’s always a good feeling to check off the most daunting task on your to-do list by mid-morning or lunchtime. Aside from the psychological benefits, many people actually find it easier to get things done in the morning. Just as your motivation for exercise tends to lessen as the day wears on, so it’s harder to be productive at work. If you really want to increase productivity, you have to be able to say no to people. Agreeing to everything is a sure recipe for feeling overwhelmed and losing track of your priorities. Keep in mind that whenever you agree to take on a new project, something else is automatically relegated to the back burner. Think before you agree to something and ask yourself if you’re willing to make this new project a priority. If not, politely explain that you simply couldn’t give it your best effort right now. While doing several tasks at once may seem like a good strategy, it actually makes you less productive. When you multitask, you tend to make more mistakes and forget crucial points. It’s much better to give your complete attention to the task at hand, finish it and then start something new. Of course, in practice it’s difficult to completely avoid multitasking. You can, however, keep it to a minimum. The right setting helps you concentrate. This includes the kind of chair you sit in, your view and the noise levels in the room. Some people prefer complete silence. Others prefer classical music, rock or atmospheric sounds. Find out what makes you most productive and set up your work area accordingly. When you’re writing your do-to list or trying to come up with creative ideas, use the method that works best for you. Don’t underestimate the value of writing things down on paper. One benefit of this is that you avoid the distractions of electronic devices. Another method that works well for some people is speaking into a microphone and transcribing the words later. In an age when everyone want to know how to be productive, it’s not surprising that there are so many tools and apps created for this purpose. Here are a few examples of tools that can help you increase productivity. Sanebox – a program that helps you reduce distractions in your email, ensuring you only get the most important messages in your inbox. Other messages are sent to another folder where you can read or discard them later. Rescue Time – One of the best time management tools that tracks everything you do on your device and sends you a report. Unroll Me – This is a great tool for anyone who subscribes to multiple email lists. With this program, you can view all of your subscriptions in a single email and browse them in one session. This makes it easy to ignore messages that don’t interest you and unsubscribe from lists you’re not interested in. With all the demands of growing your business, managing cash flow, credit and receivables can be a challenge. Contact Riviera Finance today and find out how we can customize a factoring solution for you.